Healthcare experts always advise people to gain weight in a healthy manner. One can gain weight by 1.1 lbs per week by increasing their calorie intake by 500 Kcal. At the same time, it is highly important to maintain a normal body mass index (BMI), which means it is crucial to restore ideal weight according to one’s gender, age and height. Healthy weight can be gained by building bodily tissues (muscles), maintaining a proper nutritional status and ideal body weight. 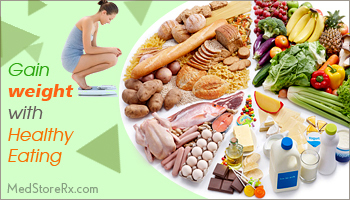 To put on healthy weight, one should pay attention to a strict diet plan. A well-balanced diet is necessary to gain weight; you need adequate amount of proteins, carbohydrates and fats to maintain a healthy weight. Particularly, foods rich in protein should be consumed to build muscles. 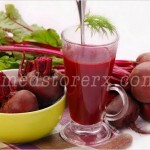 It is important to consider foods that are useful to your heart and blood vessels. Rely on foods such as pistachios, salads, soy sticks, multi-grained or whole-wheat bread. These foods help lower the risk of cardiovascular diseases, like atherosclerosis. If you have a habit of overeating, then cut it out. Experts advise to eat 5-6 small meals or 3 large meals per day. Simultaneously, select foods with essential vitamins and minerals; and try to eat starchy food, like potatoes. Bear in mind; the more you consume junk food, the more you are going to suffer from health problems, because junk food can deprive you of healthy nutrients. A skinny person who relies on junk food will suffer from health problems as he/she may have to face unhealthy consequences. Many people may suggest you to eat sugary foods, cakes and pastries in order to put on weight, which is actually incorrect. Because eating high sugar-based foods can lead to visceral fat i.e. abdominal fat which may result into chronic illness. Besides, sugary foods can rob all the nutrients from the body. One should chew the food properly for proper digestion process. Do not drink coffee or tea soon after having meals, as this can hamper the iron absorption in the body. Hence, it is important to consume the right kind of food in a right manner. It is highly important to consume diet rich in fruits and vegetables that contain beneficial nutrients, especially protein, carbs and healthy fats. If you are planning to build your muscle, your total protein intake should be above 1g/lb of your body weight. Protein helps in synthesizing essential hormones of the body that are required for normal growth and development. Eat healthy fats – monounsaturated and polyunsaturated fats. Egg yolks, lean meat with animal fat, chicken, fish, coconut oil, nuts and beans are helpful in gaining healthy weight. Peanut butter, oatmeal, cheese, yoghurt, milk, nuts, olives, olive oil and bananas are few foodstuffs that are loaded with essential nutrients and are rich in good calories. 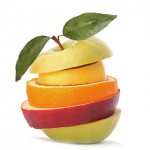 You need healthy calories to put on weight in an appropriate manner. In association with healthy diet, it is recommended to exercise regularly to tone up your body, and get adequate amount of rest and sleep. Once you have gained adequate amount of weight with regular exercise, you will realize that your body structure is curved and toned at right areas. Also, one should drink plenty of water to flush out toxins from the body. The above-mentioned eating habits are helpful in gaining healthy weight in a right manner. 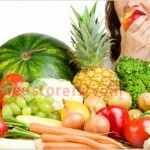 However, it is advisable to consult a well-qualified nutritionist to get a proper diet plan. At the same time, exercises should be performed under the supervision of a gym trainer.